The interaction of images and text is not new for Krasznahorkai, as he collaborated with Bela Tarr on at least four films, including two based on his novels. Those last two films diverge significantly from their source texts, and Tarr has said that modifications were made throughout the filming. So here again, despite appearances, I tried not to make too literal a tie between the images and the texts. The affiliation feels more thematic than literal. The beast’s silhouette is usually black, but occasionally white or gray. These shifts make themselves felt in the beast’s attitudes in the text for each picture. The color as well as the use of space is treated metaphysically. Neumann’s subsequent drawings after the first seem to bring out themes already present in the first text, which Krasznahorkai then elaborates on. Whether they form an actual narrative is ambiguous, but they certainly form a whole. The beast is angry, but helpless. The beast rants about how he is beyond any constraint that can be put on him by thought or concept. He is unique and beyond comparison: “It is impossible to confuse me with anyone else.” He is within you, caged in one picture, but he is struggling to break free. And so another of Krasznahorkai’s conceptual contradictions emerges: the beast that is at once free beyond everything and yet trapped. I hate all that is infinite, there burns within me an unspeakable hatred towards the infinite…the infinite is a deception, the infinite is a deception in space, the infinite is a deception in measuring, and every aspiration to the infinite is a trap, but the kind of trap that has to be walked into again and again by him who, just like myself, is searching for the end of a direction, for I have no other aspirations. Is the beast railing at the infinite itself, the inadequacy of the concept of the infinite, or the representation of the infinite (as in this picture)? I’m not sure. This tension is the same one that occurred in Krasznahorkai’s earlier From the North by Hill, from the South by Lake, from the West by Roads, from the East by River, which contained a book by a mad Frenchman ranting against Cantor’s mathematical conception of infinity. Perhaps the idea is that the conception traps us while simultaneously facing us with its inadequacy, and this is unbearable because, as with the ideas of mortality and immortality, neither side is a conceivable solution. 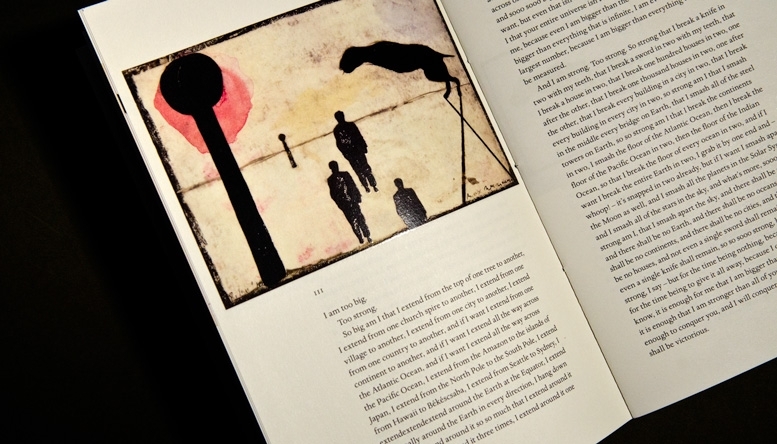 Because the text is more rarefied and abstract than Kraznahorkai’s other work, it seems to resemble Beckett at times. But Beckett never portrayed such a vicious antagonism. His personae always collapse into themselves. Even their assertions of antagonism are hopeful but futile gestures against solipsistic nightmares. That is not the case in Krasznahorkai. I do not think it ever is. His characters and voices are always struggling within a larger cosmos of forces and others. Anyone who has been reading me knows that I think Krasznahorkai is one of the greatest living writers, and as I’ve read more, his work hooks together in an increasingly revealing way. I know that a translation of Satantango is due out next year, and hope that more is on the way. The SÃ¡tÃ¡ntangÃ³ is his greatest novel. He is one of the greatest writers nowdays. I am so glad to see this review and hear your enthusiasm for Krasznahorkai and I just wanted to say that New Directions will bring out ANIMALINSIDE edition for the USA in April 2011, and SATANTANGO (in George Szirtes’ translation) in the autumn of 2011. 2011 is our 75th anniversary and having two of Laszlo’s book in the birthday year is a special pleasure. Melancholy of Resistance is such a great read. Although I appreciated War and War – it didn’t resonate with me like MOR did. I am very much looking forward to Satantango in English. Thanks for your review.